Brown ales have never blown me away. You may be able to find a pretty good one from time-to-time, but if a "word class" one exists then maybe you can tell me where it is. So, today we have Palo Santo Marron which is an imperial brown ale aged in Paraguayan Palo Santo wooden vessels. Pours an extremely dark brown, bordering on pitch black. I get some ruby red on the edges. It had a minimal, light brown head that went away quickly. A lot of wood on the aroma. I also pick up raisins and even a hint of cherry. Some slight vanilla and a miniscule booziness too. I don't pick up any nutty flavors associated with the style, nor is there any big hop presence, but there is a noticeable roasted malt aroma. The same wood on the aroma is front and center on the taste. There's almost a molasses, syrupy sweetness and mouthfeel to this. This borders on smokey with such a strong roasted presence, but not anything close to a rauchbier feel. The wood has given this brown ale strong hints of vanilla and a slight caramel, but the latter is barely noticeable. Dark fruits, plums, and cherries become more prominent on the back of the tongue. The sweetness takes away any bitterness with hops being practically non-existent. At 12.0%, there is a warming sensation on the finish, but in terms of any pure alcohol taste, I am glad to say that it isn't there. In terms of the style, this is much thicker than usual and it has such a robust flavor profile. As mentioned earlier, the brown ale style is hit or miss. 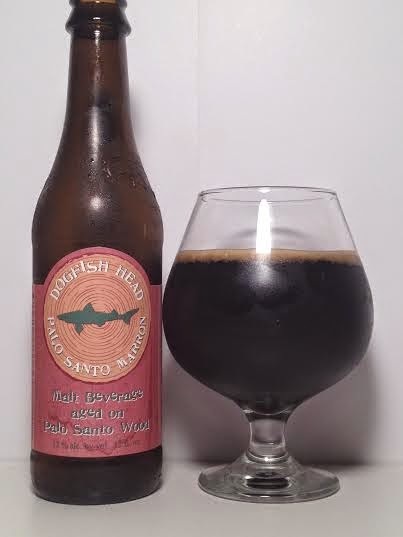 Palo Santo Marron is in the upper tier of brown ales with an array of complex sweetness and fruity flavors. Combining dark, fruity notes with a molasses and vanilla kick makes for a surprising and pleasant experience for your palate. As a 12.00% offering, this drinks lighter than it's abv while giving you a smooth and robust beer ideal for after dinner or enjoyed just on its own.